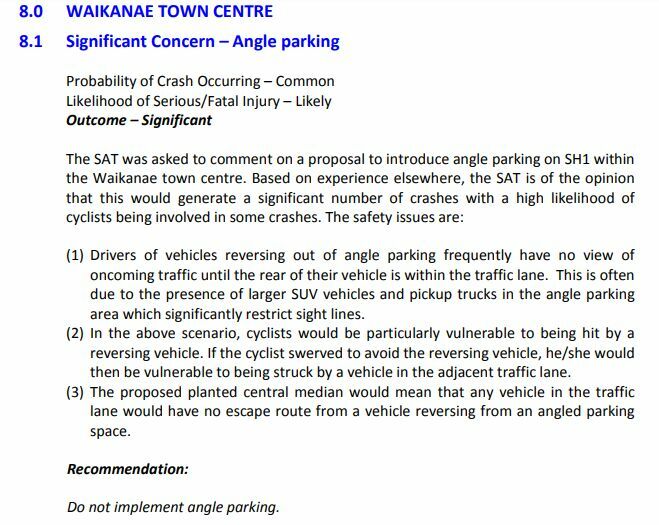 That was decided at today’s council meeting, which selected “approach 1” on page 6 of this pdf, instead of “approach 2” which featured angle parking. Local businesses, unsurprisingly, wanted angle parking, so making more parking places, probably in the belief that a lot of people are lazy sods and if they can’t park very close to the shop concerned, they’ll go to another similar shop where they can. General residents, however, were concerned about the safety risk of angle parkers reversing out into the path of cyclists they can’t see. Cyclists, naturally, were opposed to angle parking. The above argument seems to have won the day. The local businesses should be reasonably happy, nevertheless, as they are still getting 32 parks in front of them on the Main Road, an increase of 10. The angle parking option would have provided 41. The councilors were presented with “approach 1” and “approach 2” as the only alternatives; but a third option should have been to leave the road layout as it is. What bothers us is that “approach 1” involves the removal of one of the road traffic lanes between the Elizabeth Street and Ngaio Road intersections, in the northbound direction. Inexplicably, the southbound direction will still have two, however. Why on earth are two needed in the southbound direction, but only one in the northbound direction? Surely, the number of motorists turning north from Elizabeth Street into the Main Road are the same as the number who turn from Main Road into Elizabeth Street from the north? Our view, as has been repeatedly stated on here, is that the existing two lanes in each direction are needed. Well, the bureaucrats want to make the median wider in this area for no particular reason and, most importantly to them, insert their cycle lanes — today these are the “Politically Correct” stance, so you’re going to get them, whether they are needed or not (and several submitters said they are not).